Can’t get this Upgrade in stores. In the future, technology is intertwined heavily with the average human life. Anything from cars to drones to cooking is automated and few think twice about it. One who does think about it is Grey (Logan Marshall-Green), a stay-at-home auto mechanic who keeps busy repairing and selling cars while his wife, Asha (Mellanie Vallejo) brings home the bacon. The couple are in good spirits after Grey sells one of his rides to Eron Keen (Harrison Gilbertson), the brilliant-yet-antisocial owner of Vessel, a tech company poised to redefine technology with STEM, an implanted device that can control the entire body. On the way home, Grey and Asha are attacked by hired thugs, and the aftermath leaves Grey completely paralyzed. Tired of being unable to live without basic functions, Grey takes Keen on his offer to implant STEM to give him walking capabilities again. That he does, and he immediately begins to exact revenge on those who took away everything, while fighting back against his new body and mind. 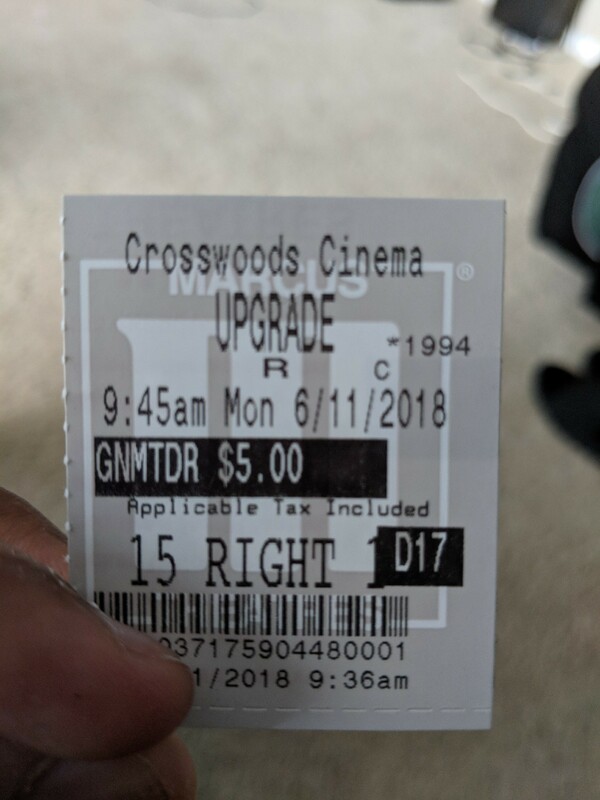 A combination of RoboCop, Blade Runner, Dredd, and Death Wish (among other movies) is Upgrade, a futuristic, vengeance-driven film from the mind of Leigh Whannell. Along with James Wan, the man behind two of the most well-known franchises in Saw and Insidious tries his hand again at horror, this time in the realm of body horror. Crossing over many genres, actually, Upgrade’s innards aren’t exactly high-quality, but their quality is good enough to make for a fun view. The Internet’s had the Upgrade comparisons to some upcoming movie called Venom locked and loaded since the first trailer dropped for the former. And, they are there in more ways than one; sub the symbiote for STEM and modern day for the future. Long way of saying Whannell’s script is perfectly fine and really doesn’t say anything other science-fiction movies haven’t done better and stronger than Upgrade does (the technology overtaking its creators and hosts is an age-old theme, but one that can still feel profound and new in the right hands), though Whannell’s feature probably fits better as an actioner/horror than a thought-provoking sci-fi. Once Upgrade introduces STEM (voiced by Simon Maiden) as a co-starring character, the film finds its tone as a campy, pulpy, light neo-noir feature. Outside of one instance, Whannell’s scenes of action are unique, mechanical, über-violent, unpredictable, and satisfying as they are set to the rhythm of composer Jed Palmer’s score. However, STEM is not only around to deliver payback. He’s also the comic foil, delivering super-dry, straight-laced dialogue to contrast with some of the bloody moments. STEM, along with the “discount Tom Hardy,” give Upgrade sentience. Tagging the lookalike Logan Marshall-Green the discount moniker is funny but subtly implies LMG is lesser in talent than he is. This is a tough role especially from a physical standpoint, but Marshall-Green pulls it off with confidence and charisma, akin to Peter Weller in 1987. His interplay with STEM is almost always entertaining. The movie’s about them and their evolving/devolving relationship, but it would have been nice if any of the other characters and cast members made a lasting impression. Fact is, they are means to an end (a great ending, but still just means) and are forgettable from that standpoint. On a $3 million budget, Whannell gets the most out of it from everywhere except the cast. Nowhere is this more disappointing than for Betty Gabriel, one of two scene-stealers in Get Out who is reduced to a dull, stock police officer with no personality. Anyone could have played this role. Augmented with pieces from many genres, Upgrade isn’t a clear level above most of the films it is inspired by, but that doesn’t stop it from becoming another notch in the successful filmography of Blumhouse Productions. More than the sum of its parts? Certainly. Photo credits go to GQ.com, slashfilm.com, and IMDB.com.